The iPhone XS series and the iPhone XR may seem superficially fairly similar, but when you look closely at them, there are some key differences that set them apart. Understanding what those differences are and how they'll affect using the phones is crucial to understanding which you should buy. So, to help you make a smart purchase decision, here's a look at eight key ways that the iPhone XS and XS Max are different from the iPhone XR. You can tell just by looking at them that the screen is one key difference between the XS, XS Max, and XR. But it's more than size that's different here. The iPhone XS has a 5.8-inch screen, the XS Max a 6.5-inch screen, and the XR a 6.1-inch screen. More than just raw size, the technologies used to create the screens matter a lot. The XS series uses OLED screens compared to an LCD screen for the XR. Because of how they generate light in the pixels that make up the screen, OLED screens are brighter and provide a much wider dynamic range and contrast ratio for blacks and colors. In short: they look fantastic and the picture quality of OLEDs is much better than that offered by an LCD. That's not to say that an LCD screen doesn't look good; it does. In fact, LCDs have been used on smartphones for many years. OLEDs are the future, though, and if you want the best-looking screen possible, you'll need to get an XS. The saying goes that the iPhone is the most widely used camera in the world. And with good reason: The camera on every iPhone is pretty terrific, but when it comes to comparing the XS series and the XR, the XS comes out on top. Single vs Dual Camera: While all of the phones take 12 megapixel photos, the back camera on the XS series is actually two cameras combined into a single system. This gives the XS series the ability to take better photos, to use a telephoto lens in addition to a wide-angle lens, and more. The single-camera system on the XR means that it can't offer these features. Fewer Portrait Lighting Options: The iPhone X series' signature Portrait Lighting feature is more complete on the XS series. There, you have five Portrait Lightning styles to choose from whereas the XR, with its more-limited camera, only offers three. No Optical Zoom: Both phones offer a zoom feature for images, but only the XS uses optical, or hardware-based, zoom. The XR performs the zoom in software, which can result in a lower-quality, more grainy image. These differences may make it seem like the XR's camera isn't good. That's not correct. It's a terrific camera for most people and will take terrific images and video. It's just that the XS's cameras are nearly professional grade. The XS series marks a first for the iPhone: The first models to offer 512GB of storage. That huge figure means those models can store a couple hundred thousand photos, along with all kinds of other data, according to Apple. The XS also comes in 64GB and 256GB models. The iPhone XR, on the other hand, tops out at 256GB, but it also offers a 128GB model that the XS doesn't. It's hard to imagine most people needing a phone with 512GB of storage (on my 256GB iPhone X, which is packed full of music and photos and other data, I still have over 150GB of free space), but almost everyone will be well served by 128GB or 256GB of storage. The difference in the weight between the three phones is only about an ounce, but that may be enough to make a difference for some people. 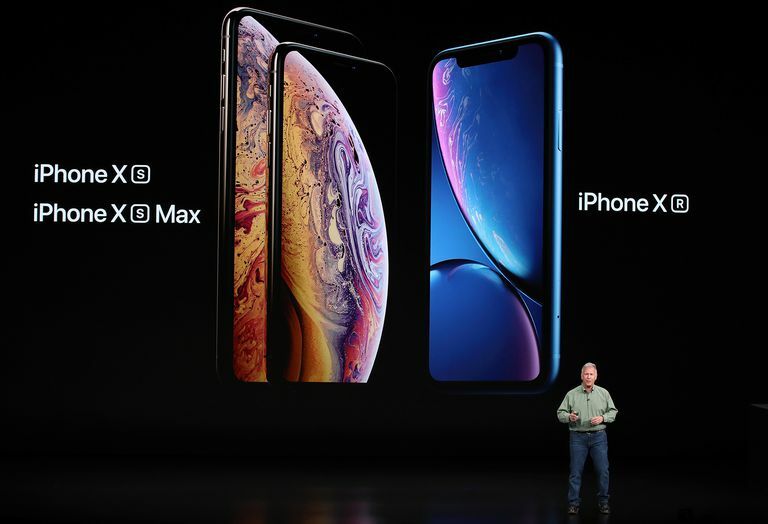 The iPhone XS weighs in at 6.24 ounces, the XR at 6.84 ounces, and the XS Max at 7.34 ounces. Half an ounce or an ounce may not seem like much, but that weight can add up if you're holding your phone for a long time. If you think you could be sensitive to the weight differences, try holding the phones in the store before buying. The iPhone X introduced in 2017 brought IP67-class waterproofing to the iPhone lineup. That level of protection allows an iPhone X to be safely submerged in up to 1 meter of water for up to 30 minutes. The iPhone XR offers the same level of protection. The XS series improves on that protection by adopting the IP68 standard. Both XS models can be submerged in up to 2 meters of water for 30 minutes and still not be damaged. In some ways it's a small change, but it also makes it more likely that the XS can survive a soaking. The higher-end iPhones like the XS series tend to come only in restrained colors like silver, grey, and gold. The iPhone XR is the first model since the iPhone 5C back in 2013 to bring some bright colors back to the iPhone. The XR also comes in red, yellow, blue, and coral (plus black and white). If you want to brighten up the look of your phone with some color, the XR is your only option. Earlier iPhone models — the iPhone 7 and 8 series — are still available at lower prices, for the budget conscious. You also don't have to spend the full price of the phone up front, thanks to Apple's iPhone Upgrade Program which lets you buy in monthly installments.